Blackpool is unique, there is no destination like it in the UK! It is home to the famous illuminations known as the greatest light show in the world. With over a million light bulbs making up a variety of fabulous displays, and with live cabaret entertainment each night in our hotel, and a privately charted tram for us to enjoy the illuminations this tour is sure to be a memorable experience! Tuesday- Today we visit Fleetwood Market, a busy traditional coastal market offering a great seaside shopping experience, Fleetwood Market has over 150 stalls within three indoor heated halls and a selection of outdoor stalls. A true shoppers paradise youll find a variety of stalls including jewellery, clothing and household goods. Wednesday  The traditional seaside town of Southport is our destination today. Described as sophisticated, cosmopolitan and vibrant, Southport has the second longest grade II listed pier in the UK. Thursday A free day for you to enjoy all that Blackpool has to offer. 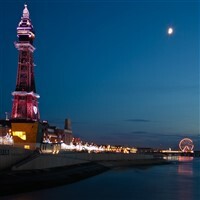 With so many attractions including the famous Tower with its ballroom, The Winter Gardens, and of course the delights of Blackpools Golden Mile. After an early dinner we will take you on a complete tour of the amazing Illuminations from a privately chartered Tram from one end to the other. Friday  Sadly we leave Blackpool and head back to Wiltshire arriving back in time to meet our waiting taxis late afternoon. This superb family hotel is located on the north promenade overlooking the famous Blackpool seafront and within walking distance of all Blackpools major attractions. The bedrooms are all en-suite with TV's, tea/coffee making facilities, hairdryer, radio alarms, & direct dial telephones. There is also excellent live entertainment in the cabaret bar every evening. Home Pickup with Full Hostess Service.